Ascott-under-Wychwood residents will be able to take the train to do their Christmas shopping again this year. 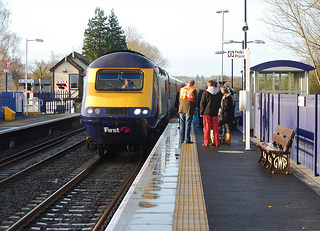 At the request of the Cotswold Line Promotion Group, First Great Western has agreed for the third year running to provide Saturday services at the station on the four weekends before Christmas. As well as trains to Oxford and London, there will be the chance to visit Worcester’s Victorian Christmas Fayre or Great Malvern for the afternoon on Saturday, November 30. The CLPG hopes residents will once again turn out to use the trains and signal their support for the reinstatement of regular Saturday services at the station, which were withdrawn in 2006. We hope that residents in the local communities will make full use of the trains to Oxford, London, Worcester and other destinations. The CLPG will continue to campaign for more services to stop at Ascott and Shipton, and heavy use of these Christmas trains will help, by showing that the communities would value more services. The 07.10 from Hereford to London will call at 09.03. The train is due to arrive in Oxford at 09.28 and London Paddington at 10.29. The 11.21 from Paddington to Worcester and Great Malvern, which leaves Oxford at 12.23, will call at Ascott at 12.48, reaching Worcester at 13.44 and Great Malvern at 14.00. The 15.21 from Paddington to Great Malvern (16.23 from Oxford) will stop at Ascott at 16.45. In addition, on November 30 only, the 17.49 from Great Malvern (18.06 from Worcester Foregate Street) will call at Ascott at 18.59 to bring home afternoon visitors to Malvern and the Worcester Victorian Christmas Fayre. (Information kindly provided by William Crossley).